This was too much for Sam. It needed a week's answer, or none. He turned away and mounted his pony. But as he started off, Rosie ran down the steps. Sam looked a bit awkward. 'It's not that, Mr. Frodo,' said Sam, and he went very red. And so it was settled. Sam Gamgee married Rose Cotton in the Spring of 1420 (which was also famous for its weddings), and they came and lived at Bag End. And if Sam thought himself lucky, Frodo knew that he was more lucky himself; for there was not a hobbit in the Shire that was looked after with such care. ... Sam turned to Bywater, and so came back up the Hill, as day was ending once more. And he went on, and there was yellow light, and fire within; and the evening meal was ready, and he was expected. And Rose drew him in, and set him in his chair, and put little Elanor upon his lap. Birth of Elanor the Fair, daughter of Samwise. Death of Mistress Rose, wife of Master Samwise, on Mid-year's Day. Cotton, in fact, represents Hlothran a fairly common village-name in the Shire, derived from hloth- 'a two-roomed dwelling or hole', and ran(u) a small group of such dwellings on a hillside. As a surname it may be an alteration of hlothram(a) 'cottager'. Hlothram, which I have rendered Cotman, was the name of Farmer Cotton's grandfather. Cotton. This is a place-name in origin (as are many modern surnames), from cot, a cottage or humble dwelling, and -ton, the usual shortening of 'town' in place-names (Old English tūn 'village'). It should be translated in these terms. It is a common English surname and has, of course, in origin no connection with cotton the textile material, though it is naturally associated with it at the present day. Hobbits are represented as using tobacco, and this is made more or less credible by the suggestion that the plant was brought over the Sea by the Men of Westernesse (I 18); but it is not intended that cotton should be supposed to be known or used at that time. Since it is highly improbable that in any other language a normal and frequent village name should in any way resemble the equivalent of cotton (the material), this resemblance in the original text may be passed over. It has no importance for the narrative. A wild rose, Rosa canina, after which Rosie Cotton may have been named. There are two roses native to Britain that are easily envisioned in Middle-earth. 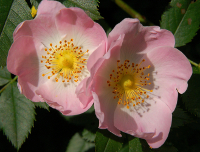 One is the Rosa canina (briar, dog rose, wild rose).... It grows to around ten feet and can be cultivated as a dense shrub or on trellises. Although it has waned in popularity as more showy roses have taken prominence and is now used as root stock for hybridizing, it still graces the English countryside in hedgerows. Despite its delicate beauty and reputation for touchiness, the rose is remarkably hardy. Many will thrive with little or no care, and an unwanted plant can be very difficult to retire; once firmly rooted, it will persevere. While there are countless roses, they escape commonality and are treasured, as is Rosie Cotton by Sam, who comforts himself during hardship with thoughts of her and her brothers in happier days.